Wishing you could escape for the holidays? How about a desert island, or a sun-drenched beach with waves lapping at the shore? With a little imagination anything is possible. 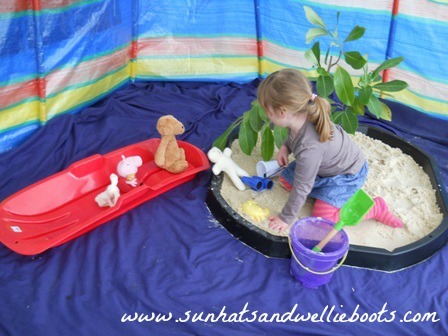 We're fortunate enough to have a gazebo in our garden, which provides shade from the sun & shelter from the rain when we're playing outside, & it's under this gazebo we created our Desert Island Play Space! Perfect for escaping to the beach even on rainy days! 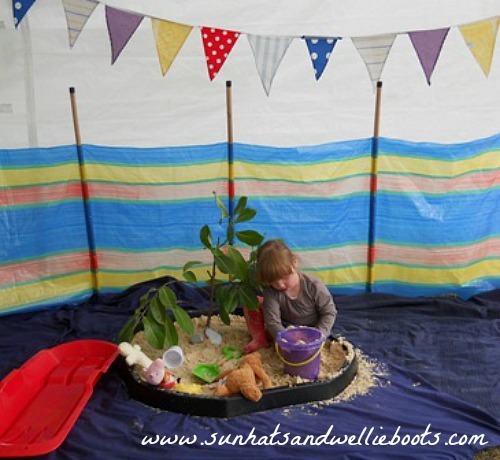 We spread out a blue bed sheet, & added a large plastic mixing tray which we filled with sand. (Any large sturdy container, or sheet of tarpaulin would work well too.) 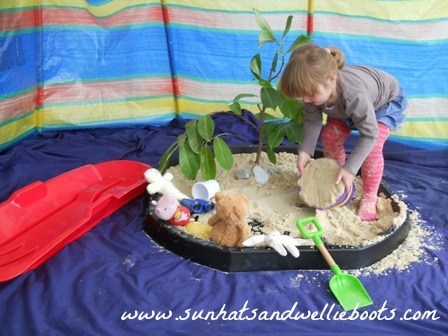 Our windbreak created a beach theme background, & with a branch from the garden we made a palm tree, added a few shells & pebbles to the sand, & our island was ready to be explored. To reach the island we needed a boat, & our trusty sledge was ideal for the job! Minnie had so much fun sailing her boat back & forth across the sea, pretending to swim & splash in the water, & watching her toys go for a swim. Then it was time to make (& jump on) a sandcastle or two! 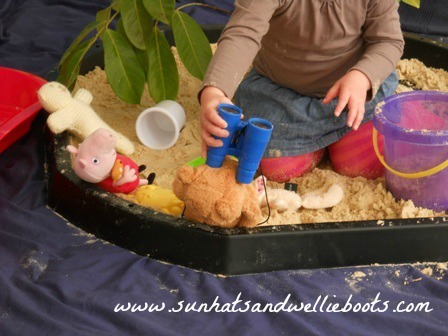 Minnie loved burying her hands, feet (& toys) in the sand! The toys even had time for a spot of bird watching before they set sail! I guess if you were on a pirate ship you could take a telescope, map & a chest full of treasure with you, or hide treasure on the island. 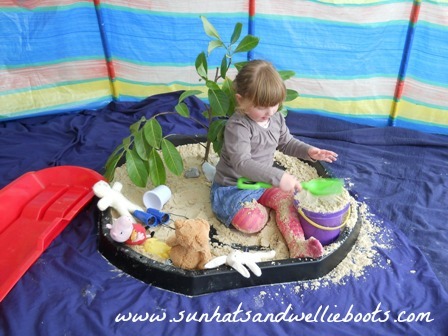 If you don't fancy having all that sand inside your house, a simple desert island play area can be set up with other household items. 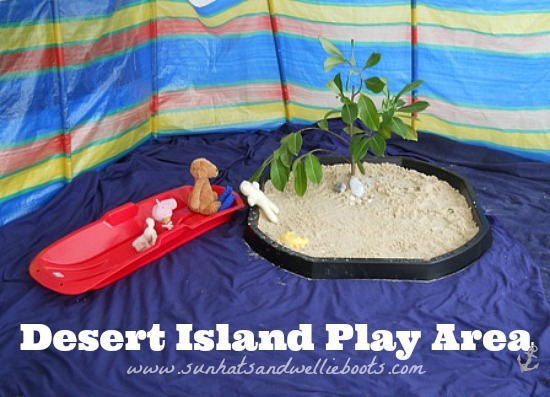 How about blue sheets, tarpaulin, or large blue Ikea bags for the sea, & for the island how about using yellow/beige blankets or towels, or a large sheet of cardboard cut into the shape of an island. 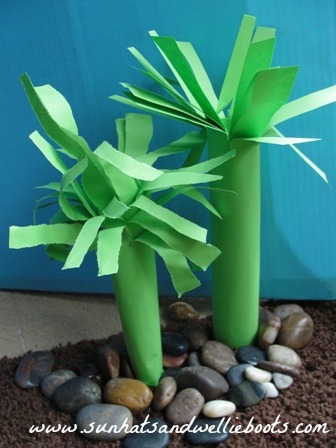 To create some island foliage how about paper trees, or pot plants. Cushions make great rocks to sit on, or build with too. 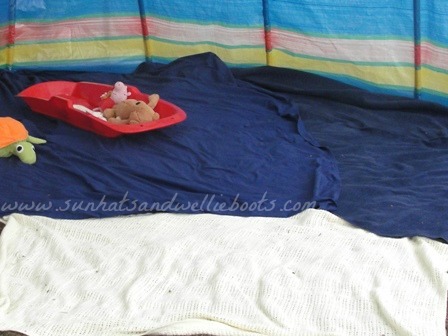 "Row Row Row Your Boat"
"A Sailor Went To Sea, Sea, Sea"
"The Big Ship Sails On the Alley-Alley-Oh"
It's amazing how just a few bed sheets, towels & other simple items can create so much fun, imaginative play, & discovery! I wonder where Minnie's voyage will take her next?